So. Going to school is upon us again. 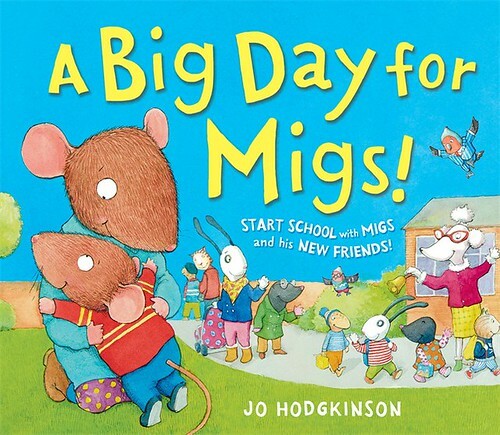 Migs is starting, for the first time (yes, I know that’s what starting means), and Jo Hodgkinson shows the reader what a typical first day at school might be like. You worry at first, but then, like so many children, Migs discovers that this school thing isn’t bad at all. He might even want to return tomorrow. Whereas Freddy in Charlie Higson’s and Mark Chambers’s Freddy and the Pig, isn’t too keen on school. He wants to stay at home and play computer games. (He’s rather lazy, truth be told.) So one day he sends his pet pig to school instead. 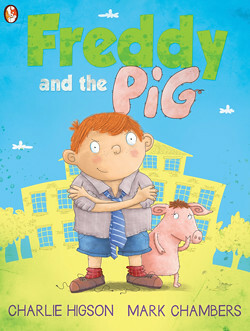 The thing is, in this dyslexia friendly book, that the pig actually likes school. He gets better and better at it, and by the end he’s got himself a university degree and everything. Freddy? Er, his mother sold him. Call me childish if you will, but I do quite fancy being on the cover of a Harry Potter book. After all, I’m a witch. 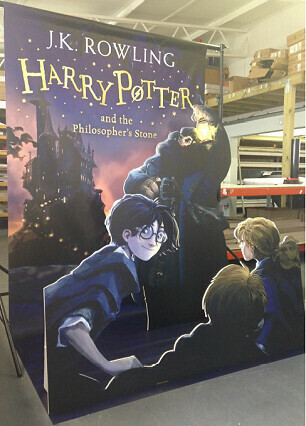 This life size cover will be at King’s Cross today, somewhere near platform 9 ¾, from seven to seven. I believe you can be photographed inside the 3D cover (and I’m hoping it’s free, but they didn’t actually say), as they are celebrating the new edition of Harry Potter. I’m fairly sure it’s the same picture as was on the poster Son bought in Sweden back in 2002, and which sat on his wardrobe doors (yes, doors; we cut it in half) for longer than you’d think would be considered cool. Daughter bought another poster, and I bought wallpaper. The real kind, not what you have on a computer. And a suitcase, to transport it all home. I can’t help it. I like what Nick Green writes. Very much. His books are precisely how you want children’s books to be; exciting and fun, and just that little bit different. Nick first offered Project Firebird for me to read when he’d finished it a few years ago, and I loved it. But I knew he had edited it substantially, so felt it was best to re-read the new version. Nick is about to publish Project Firebird as an ebook in September, along with its two sequels. It’s a dystopian adventure, with a twist. We first meet the main character – Leo – in his joy-riding days, in Salford of all places. His actions cause him to end up as one of a group of 25 (ish) young teenagers at a centre in the Lake District. They are there because they have all done a ‘good’ deed. They are different. Events unfold in a way I don’t want to give away, but let’s just say that the plot changes dramatically several times. When you think you know, expect to be surprised, again. The teenagers learn new skills and how to cooperate with each other (well, they are meant to) and to prepare for a bad future. Project Firebird isn’t one of those books where you are dismayed to learn there are two more. On the contrary, you won’t want to wait to start on the sequel. 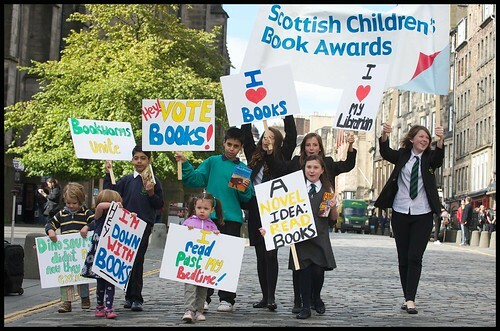 The latest shortlist for the Scottish Children’s Book Awards has been announced today, and from now until next year young Scottish readers can vote for their favourite books. I’ll read to that! 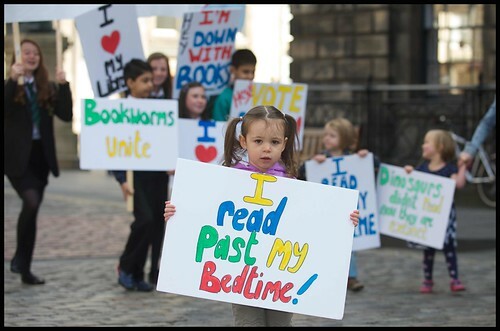 I can’t vote, but we will find out who wins on 4th March next year, after Scottish children have had their say. And the rampaging robots. Were I not totally unworthy, I’d love to be best friends with Lizes Laird and Wein. They are so brave and adventurous and so funny. No wonder they write fantastic books. Write about what you know. Well, these two ladies know a lot. Elizabeth Wein spent the summer strapped to the top of a small plane (which then takes off and flies). The strapping part seemed to be due to health and safety rules. Quite. Otherwise it’d be fun to just stand there, on top of a plane up in the air. Her next book, Black Dove White Raven is about circus flying, which is why Elizabeth needed to have a go. Because she loves flying, anyway, and this was fun. She showed us photos from Ethiopia – which was the topic for the day – and when Elizabeth Laird looked more closely at a range of mountains, it turned out she had walked across them. When she was young (which apparently made it nice and easy and nothing to write home about!). EL had also once stayed with EW’s aunt and uncle in Ethiopia, many years ago. 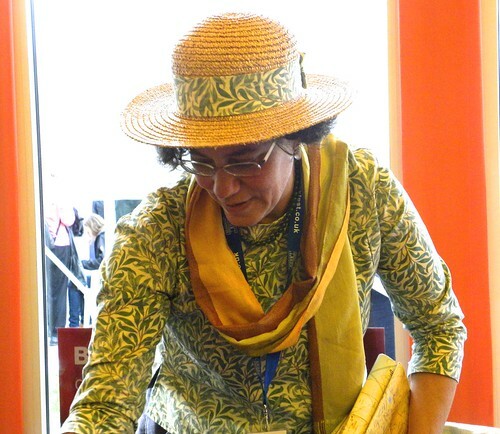 Because EL spent a few years in Ethiopia in the 1960s, teaching – as you do. That’s when she witnessed the homecoming of Olympic champion Abebe Bikila at the airport, where she just happened to be. The Emperor met the plane, complete with favourite lion, to honour the country’s hero. It’s the done thing. Now everyone in Ethiopia runs. Partly to get to school, when that happens to be six miles away from home and you have no car, and partly in the hopes of making it to the Olympics. Elizabeth’s new book, The Fastest Boy in the World, is about a runner. Obviously. Elizabeth Wein’s book, which is due out next year, features female pilots; one white and one black. They are part of a group of pilots trained at Tuskegee, who came to Ethiopia in 1935 to set up the Ethiopian Air Force during the second Abyssinian war. The Emperor wanted to have planes and black pilots from the US. Both Elizabeths have written other books set in Ethiopia; EW’s A Coalition of Lions is set in the sixth century, and EL’s Prince Who Walks With Lions is about a young prince during Victoria’s reign. Liz managed to forget the title of her book momentarily, and made a joke out of it. In fact, both of them are really very amusing and they should make something of this. They said they will now need to agree in advance who gets to write about what, so no doubt they will divide up Ethiopia between them. EW admired EL’s fictional grandparents, and EL proceeded to unwrap her real grandfather’s real WWI medals. And she didn’t just show us them, but trusted us enough to allow the medals to circulate round the room. Asked about writing, EL told the audience to write from the heart. Only you will know your story. Read, write and live/do stuff (which includes being strapped to the outside of planes). EW thinks people should write about what they are passionate about, and she is sure she will have to fight EL for Haile Selassie’s lion. The best things about Ethiopia according to EL is the weather, how beautiful the country is and the people. EW agrees about the wonderful people and told us about the clever children she met in the middle of nowhere, who were able to write in three different languages. Boring these ladies are not. So maybe Gill Lewis is the next big thing? She had a long queue outside her venue yesterday morning, and the EIBF director came to listen (I imagine it’s like having the head teacher sit in on a lesson) and everything was great. Long queue in the bookshop afterwards, which meant I didn’t get to say hello until much much later. They handed out clipboards to the audience, and even the adults were allowed to have one. Gill began by showing us some rock art (as in ‘caves,’ not music) in Zimbabwe (along with her husband holding a plastic carrier bag) – which apparently is like Dartmoor, but different. Gill is not quite sure why she writes, but rock art has something to do with it. So she asked us to draw an animal and to try and get into that animal’s mind, see what its life might be like. She herself begins a book by drawing animals and people and seeing where it takes her. She’s also very good at it, in the kind of way that makes you jealous because someone seems to be far too talented at too many things. Having talked to young carers, Gill found that what most of them fear is their family being broken up, so they use a lot of time and effort to pretend everything is fine. She used this in Scarlet Ibis, her latest book. Thinking back to her own childhood, when she certainly wouldn’t have been able to do all the chores that Scarlet does, she told us about a dare in her group of friends. They went to the garden belonging to Mr White, who they just knew was a vampire, and they went to look inside the wooden box where… No, I can’t tell you. 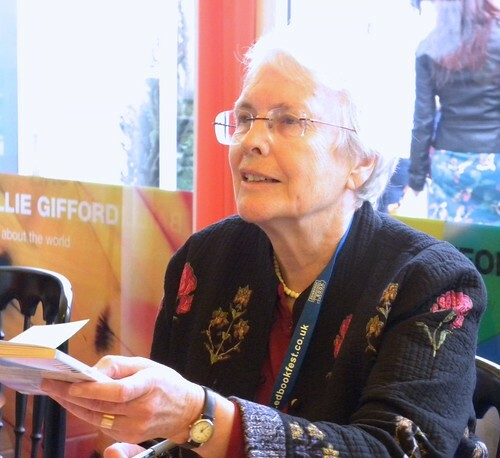 It would ruin the excitement for you if you ever hear Gill talk. She then read the dare scene where Scarlet goes to the house where an old woman is known to boil children and eat them. 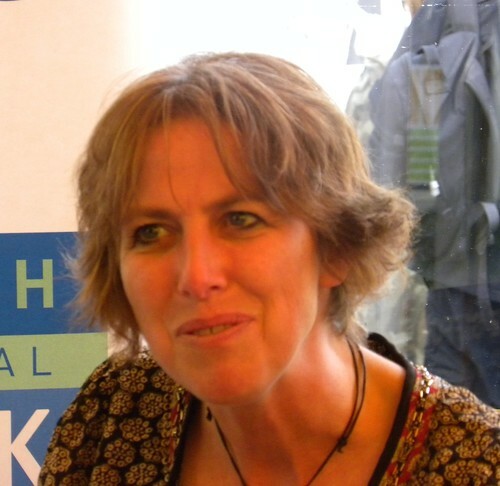 Not content with being a vet, and a writer, Gill is keen on nature in general, and wants to help re-wild the urban landscape. It’s easy; you might have a birdbox, or leave a tree stump to rot, or grow nettles. Ever the expert, she then tested us on some easy, and some pretty difficult, pictures of wild animals, before asking people to make up a riddle about their drawn animal from earlier. And I’m glad I have two of Gill’s books still to read. Sunday morning’s first event was Liz Kessler being all low tech (it seems last year she went more high tech than she liked) with a bunch of fervent fans, and a couple of children’s authors, and ‘oh, hello’ a witch at the back. Liz wanted us to keep talking, ‘no, seriously, keep talking,’ while she rustled with paper bags and got herself sorted out with her low tech goods. When we were too well behaved to obey, she asked for someone to tap dance, but no one came forward for that either. Starting off by interviewing her audience, because she likes knowing who is there, she was pleased to find a fan who treats books on fairies as non-fiction. Liz herself writes about mermaids, fairies, time travel and superpowers. Her tiniest book is a German edition of Emily Windsnap (which made Liz read some Emily to us) and then it was story cube time (which is where you throw dice with pictures on, to get the creative juices flowing, or in this case, Liz threw them at her audience). I mean how can you fail to write some epic work with props like torch, bee, beetle, arrow and fire? Especially with lightbulb thrown in as a valuable extra. She is very funny, actually, this ‘work-shy tearaway’ from Liz’s old school reports. Her box holds a bouncy ball because it looks nice. Her notebook (this is where I dropped mine) means she loves stationery, and she showed us some old paper napkins and a restaurant menu on which she had in the past written really important things to incorporate into a book. Her best book is one she hasn’t written yet. There will be no more Jessica Jenkins books, but Emily Windsnap 6 is on the way, and so is her YA novel Read Me Like a Book, which will be out next year. Having stolen Cathy Cassidy’s idea of throwing sweets at her audience, Liz finished by off-loading her remaining sweets. Her own I hope, and not Cathy’s. 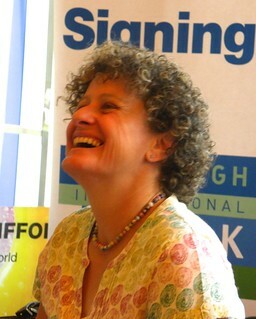 And if I’d not lost my touch – or my mind – I’d have been first in that signing queue afterwards. Not all Liz’s fans outgrow her books.